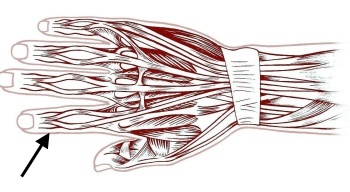 What is the therapy for injured extensor tendons to the back of the hand or the wrist? How exactly does one recognize such an injury to a tendon? What kind of surgical care would apply? Due to the thin skin on the back of the hand injuries to the extensor tendons incurred through cuts are rather frequently. They may happen to the back of the hand, above the wrist or above the metacarpophalangeal joint. Please note the small cut seen in the image to the left. 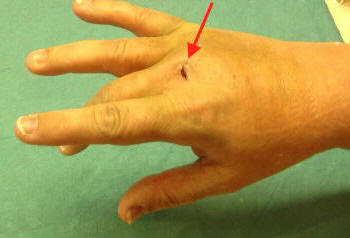 Even a cut that small may lead to the severance of an extensor tendon, if the cut runs deep enough! The concerned finger may then no longer be properly stretched out. Not in every case the loss of stretchability is that significant as in the case pictured here! Particularly when dealing with an isolated tendon injury it may not be that easy to identify it as the stretchability of the finger in some cases remains intact. The reason why there is a remaining ability to stretch out a finger which incurred the severance of an extensor tendon is that right about the same height of the metacarpophaleangal joint, neighboring smaller tendons irradiate into the neighboring fingers. This allows the injured finger to barely rise up against the force of gravity. However, it is easy to identify the tendon injury right away by confronting the injured finger with even the slightest resistance while asking the patient to lift up the finger again. A good way for a patient to check whether a tendon injury occurred could be to lift a remote control with the concerned finger. If the tendon is intact, this should not represent any problem. If the tendon is severed the attempt to lift a remote control will immediately lead to pain and the lifting process with just one finger will most likely not be possible. The image clearly shows the severance of several tendons. 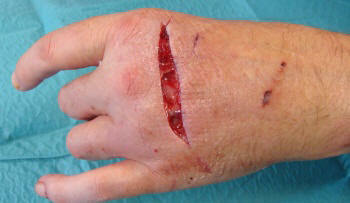 In this case the extensor tendons of the middle finger and the ring finger appear to be injured. Therefore these two fingers can no longer be stretched out! The surgery in a case like this requires the numbing of the entire arm as well as a bloodless operating surface. This means a cuff will be applied to the upper arm in order to keep any blood from flowing onto the injured hand. 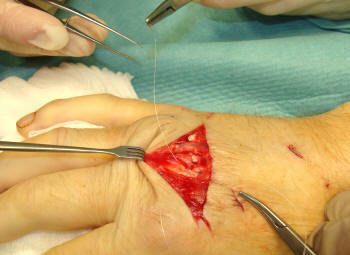 It is easily possible to identify the two tendon ends on this bloodless surface and to fuse them with the help of a specific suture technique. 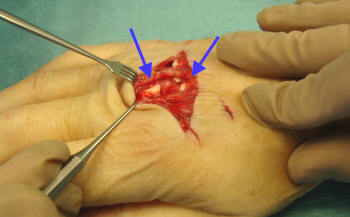 The image to the left shows such an extensor tendon suture on a bloodless surface. This surgical procedure requires the specific expertise of a hand surgeon.